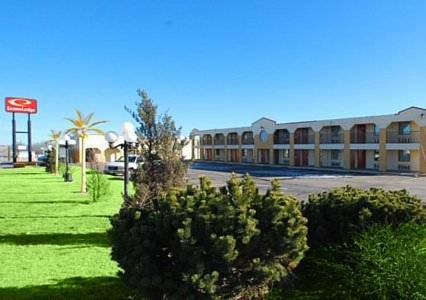 The pet-friendly Econo Lodge hotel in Shamrock, TX is an easy stop on the road. Our hotel is located right off Route 66 near the Pioneer West Museum, Shamrock Golf Club, Shamrocks St. Patricks Day celebration and Amarillo. Amenities include free Easy Starts continental breakfast, fax services and cold-weather hookups. Guest rooms come with TVs, while select rooms have refrigerators. Also, earn rewards including free nights and gift cards with our Choice Privileges Rewards program. Pet Accommodation: 10.00 USD per pet per room. Gene Cockrell has been building his own concrete statues in his yard ever since he retired in the early 1990s. Jesus, cheerleaders, dinosaurs, flying saucers -- it's an odd mix. Fend off your personal demons and allow a heaven-scratching vision to guide you off of the Interstate. Many statues and shrines around a circular plaza. And a gift shop.